Whether you are fixing a leaky faucet, a dripping sink trap, replacing toilet parts, installing a new washer and dryer, or performing routine maintenance on a boiler, Woodstock Hardware has the plumbing parts plus the technical expertise to help you successfully complete the project. Woodstock Hardware works hard to meet the needs of our plumbing professionals, the handyman, as well as the individual homeowner. We are continuously working to make sure our product lines are up-to-date with the most current technologies and codes. With our variety of products, it is not uncommon for us to be told that we are more like a “plumbing supply house” than a hardware store. We are talking 1000’s of plumbing parts. This includes; both Pex systems; Wirsbo, and Watts, Sharkbite fittings, brass compression and flare fittings, copper sweat fittings, nylon, CPVC, and PVC; insert, slip, solvent weld, and glue fittings, and brass, black iron, and galvanized threaded fittings. So, do we have the fitting you need? You bet we do. Of course, we keep a supply of the piping to go along with these types of fittings. This includes ten-foot lengths of rigid pipe and coils of copper, HDPE, and pex piping. To help out with the small projects Woodstock Hardware stocks a variety of precut lengths of pipe. So, we have the pipe you need. Our Plumbing Department is organized to help you install a wide variety of plumbing, heating, venting, and air conditioning equipment. 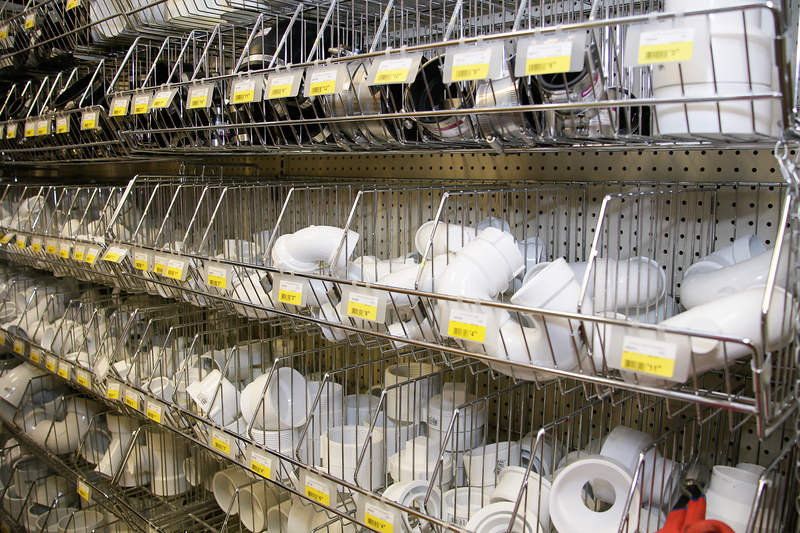 We carry all the parts you need to install your plumbing fixtures or appliances. Whether you are connecting a sink to an existing water supply or installing a vent through your roof, we have the supplies you need. 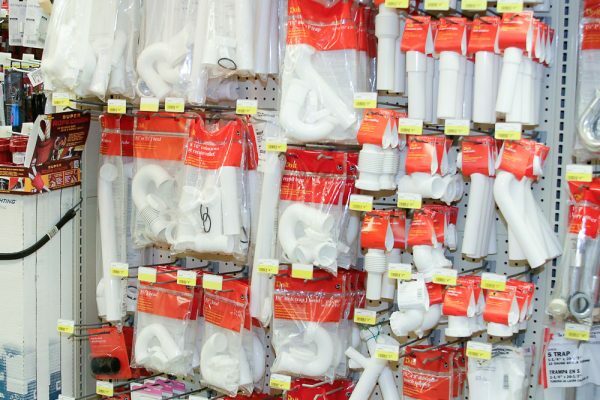 If you find yourself in our Plumbing Department you might also be looking for any number of HVAC products and supplies. Woodstock Hardware has a large inventory of HVAC supplies to help you with a wide array of projects. Visit our HVAC Department to learn more about how we can help with your next project. Your plumbing project may also lead you to a variety of home water filtration and treatment projects. Maybe you are installing a whole house, or under the sink, water filter, or maybe a water softener for the entire house. Whatever the project Woodstock Hardware’s Water Filtration and Treatment Department will have the supplies and products you need. Visit our Water Filtration and Treatment Department. You will find we offer a variety of services to make your life easier in our Clean Water For Life Program and provide our customers a wealth of information in our Water Filtration and Treatment Handbook. In addition to the extensive selection of Plumbing parts Woodstock Hardware can also provide you the technical expertise required to help you successfully complete your next Plumbing Project. Here are a few plumbing tips that may come in handy. Use caulk, not putty. Most plumbers don’t use Plumbers Putty. It damages some types of plastic and stains surfaces such as natural stone. Plus, it tends to dry out, crack and allow leaks. Silicone caulk is a safer, longer-lasting sealant. Tape and dope are equally reliable for sealing pipe threads. Unlike dope, tape is for pipe threads only. Don’t use it on compression or other connections. Make sure you use the yellow tape on gas fittings. Always wrap the tape clockwise around the threads or the tape will unwrap as you screw the joint together. When you’re replacing a toilet or a faucet, you can save a few bucks by reusing the old flexible supply lines. But don’t. Buy new lines that are encased in braided stainless steel; they’re much less likely to burst. If you already have braided lines that are several years old, replace them. When a threaded connection won’t budge, heat sometimes does the trick, especially on ancient connections that were sealed with pipe dope that hardened over time. Be patient. Getting the metal hot enough can take a couple of minutes. Protect nearby surfaces with a flame-resistant cloth. This method is for water and waste pipes only, never for gas or fuel lines. Replace Metal Drain Lines with Plastic. Metal drain lines under sinks look a lot more reliable than plastic. But plastic is better in almost every way. It’s cheaper, easier to install, and easier to adjust or tighten if a leak develops. And unlike metal, plastic won’t corrode. So, the next time you need to fix your leaky faucet, the toilet handle breaks, you want to install a water filter in your home, or are ready to start your next big plumbing project Woodstock Hardware has the products and supplies you need. So, stop in, take a look around, ask a few questions. At Woodstock Hardware we are confident that by our combining our extensive inventory of supplies, and products with our hands-on experience and expertise we can help you successfully complete your next project.